Seven US nationals today flagged off by a local tour operator here for ten district tour by motorcycle. The US nationals who are on visit to hill states of Uttarkhand and Arunachal Pradesh on tourist visa visited Itanagar to know more about the frontier state of Arunachal Pradesh about its tribal culture, flora and fauna, natural beauty and was mesmerised by its ethnic tribal culture with tradition says a tourist to this daily. Rockwel Charles Anthony (Scholar) said that we heard about Arunachal is a land of rising sun with lots of beautiful valley and rivers flowing through high rise mountain and we wanted to explore ourselves and enjoy the beauty of nature. Sonam Wangchu (Nepali Tourist) who is also accompanying the group said that really Arunachal is so beautiful, roads are under constructing once it is competed the state capital will also boost up with tourist. He said that we all will be going through the tourist circuit of state and later we shall reach Tawang by seven motorcycle. 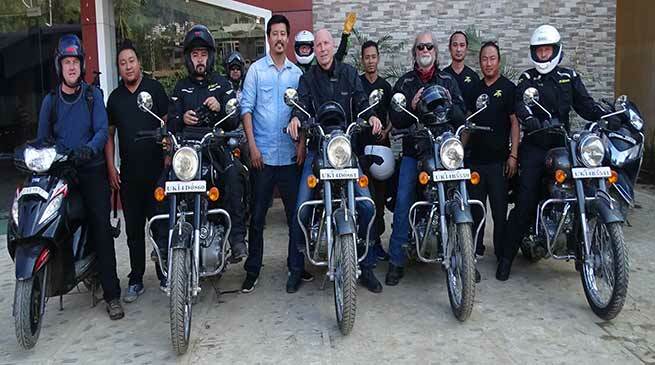 Tour operation “ Jambling Tours & Travels” of Itanagar Proprietor Gelek Rapsel while flagoff the bikers said that these US national are tourist and visited our country to enjoy the nature and they find the Uttrakhand and Arunachal Pradesh to visit. The bikers will first visit Ziro adn then to Koloriang, From Koloriang to Daporijo, Aalo, From Aalo to Mechuka and then to Tuting. All arrangement have been made for them as per requirement including food and accommodation with and entertainment to enjoy and know about eh tradition, culture and natural beauty of our state. They will be enjoying the nature and will visited all the places and later visit the famous Tawang monastery via the Bhalukpong Bomdila-Tawang Tourist circuit. When asked about the days, Gelek said that they would take 20 days and back to their country with a lots of fond memory of Arunachal and its people.